When I saw the breaking news that another African-American man was gunned down at POINT-BLANK range by a police officer, whom he and his partner was able to tackle this man down and restrain him, my reaction unfortunately... is blank. Now I know for those who aren’t African-American (and even those who are of my race) who may be reading this may ask why do I have a blank reaction? Well the answer is very simple. In my 30 years of life on this Earth thus far, I have seen this “breaking news” many times before and the very sad and UNFORTUNATE outcome from each time I am fed this “Breaking News” is one outcome: The officers are indicted and are found not guilty or acquitted of ALL CHARGES. What is there to say? What is there to feel? 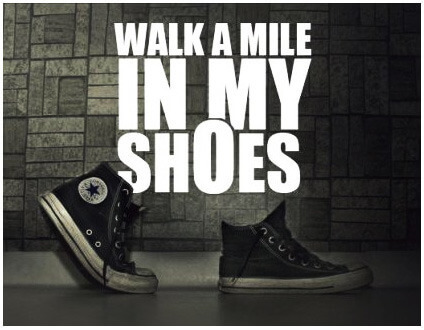 Let’s take a walk in my shoes. I am less than 25 days away from graduating from the National Urban Fellows Graduate Program at Baruch College with my Masters in Public Administration. I will be graduating on July 28th, and yet I am nervous as ever before to make it to such a milestone. I am nervous and scared; not because of my academics, not because of my financial status, but because I am a Black Man. So think about this being in my shoes; law enforcement officers can legally abuse the procedure of stop and frisk and now have the ability to obtain (or plant) evidences that they may find on me even if it is obtained unlawfully. What this means for me is that I have to literally watch my back not only from the people in my community, but from the people who are supposed to “protect and serve” me. Now take a look in shoes. The past two days two of my brothers who look like me, being citizens of this great country, who were the head of their families; whose children, and even members of the community had admired, loved and respected them, were gunned down by officers who truly abused their sworn duty to uphold the law and to protect and serve the citizens of our communities without any bias towards any one or any group that resides in those communities. A Black man, who was selling CD’s was tackled down, restrained and shot down in point-blank range. Another Black Man, was gunned down at a traffic stop, in front of his girlfriend and his child and was literally left for dead on a livestream feed on Facebook for the world to see. Look at this in my eyes; I feel like I have been shot down, I felt like I took those bullets and it is beyond painful and heartbreaking. Look at this in my shoes, I walk down the street and officers look at me like I am a zebra in the wild and they are smelling blood and are salivating at the opportunity to either stop, frisk or find any reason to pull out their gun to take me off this planet because in the eyes of these rogue, bigot and maverick officers, nothing would make them happier to see me dead. Look at this in my shoes, I am attacked socially SOLELY because on the color of my skin, which is such a threat and an intimidating factor that they would explicitly show hatred towards me. Society doesn’t even care that I am now 31 years old, I have an Associates of Arts Degree from the Borough of Manhattan Community College; a Bachelor of Arts Degree from Brooklyn College; and in 20 days a Master’s Degree from the National Urban Fellows program at Baruch College. Society doesn’t see me as the future President of the United States of America, they don’t see me as a future PhD graduate from either the CUNY Grad Center, Columbia, NYU, St. Johns or Fordham; I am simply seen as a Black man and I am therefore a target by those who want to eliminate me. White women clinch their purses when I am on the train or bus; The white community (those who are not about the true meaning of what the United States of America is about) give me looks of subliminal superiority when I attend events that they are not used to seeing Black men attend; I have to constantly watch my back everywhere I go; I have to be careful of my next steps if I walk into a store that may be closing for the day; I am followed in every store, whether I dress up or dress down; If I am driving outside the city, I have to dress up because if I dress down, state troopers may think I am smuggling drugs or a fugitive of the law; I have to deal with looks of intimidation because people who feel they are superior to me don’t think I should speak intelligently or empower my fellow brothers of my community. These are just some of the things I had and have to face every day in my life and every day that I excel in higher education, advocate and represent my church, my schools, my communities is making me more of a target because, as in the great words of DJ Khaled: “They don’t want us to be successful”. Being a Black man in America is, in my opinion a very stressful and strenuous 24-hour job; however, I would never change my identity and who I am for nothing and no one. I am proud to be a Black Man and the UNITED States of America is just going to have to deal with it. I live on to honor my brothers who have fallen by these rouge and abusive officers of the law. I dedicate my Master’s degree to you. Marching on ‘til victory is won! !